Los Angeles Skylines is the first release of the Series 2000 collection from Kai Paquin. This library features understated traffic beds to build Los Angeles city ambiances. Covering a variety of different locations from the coast of Santa Monica to the Mountains of Pasadena, this library contains over 4 hours of rooftop and overlook recordings. 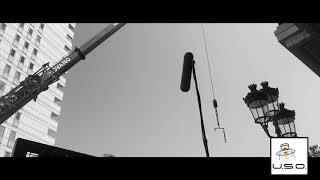 Each location was recorded for 15-20 minutes so you can find a variety of interesting moments like sirens, street walla, and trucks while having the flexibility to cut around those moments or be able to reuse the same recording on multiple scenes without it repeating. Additionally, the library was carefully tagged with metadata, including flags in the recording pointing out where moments that pop out of the bed are making it easier to find specifics to cut in or around. The OUTDOOR IMPULSE RESPONSES library from BOOM gets you realistic outdoor reverbs – fast and easy. Get the sound of silence. The roomtones are captured in surround, spread them across your speakers and each room will sound more realistic than ever. Get all benefits of Ambisonics, especially for those kinds of sounds. ROOM TONES – Industrial Building delivers hugely atmospheric ambience recordings gathered in an '80s Industrial Building in the east of Dresden, Germany. The library sounds were captured with a 4 channel 60 cm IRT cross and 4 Sennheiser MKH8020 omnis mounted. The recordings took place on a stormy and rainy Sunday. Due to the blank surfaces inside the building, thin single-glass windows and large air shafts, the weather elements got massively amplified by walls and floors. Additionally the rain water pipes are placed inside the building which caused a constant sound of flowing water. Also the sound of the central heating was clearly perceptible along the floors. The library contains 19 scenes recorded in 4-channel IRT surround. Each scene consists of 2 complementing stereo tracks and is more than 3 minutes long.